"We just do it because it seems like the right thing to do." Pizzerias make a lot of promises between having piping hot pies and making quick deliveries. But one pizza shop in Fargo, North Dakota, is really delivering on its commitment to feed the homeless in its community. 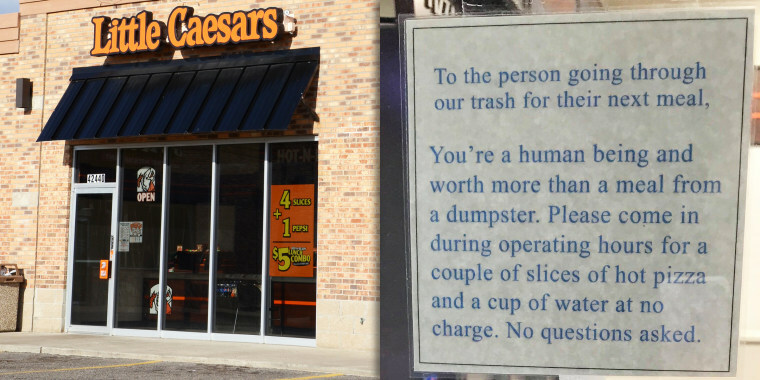 In just two years, it's given away over 142,000 slices of pizza — and it all started with a note. Jenny and Mike Stevens opened their Little Caesars Pizza franchise in May 2015 at 1020 19th Ave. N. in the north Fargo neighborhood. Four months later, the couple and their two adult daughters, Sunday Stevens and Paige Loftus, noticed that a man had been sitting outside of a nearby gas station for two hours. "My daughters and I were looking out of the window and saying should we get him something," Jenny told TODAY Food. "We brought him a pizza. He was so thankful and so gracious. Then we ended up doing it again for a different person. And again for a different person. And again for another person." "To the person going through our trash for their next meal, You're a human being and worth more than a meal from a dumpster. Please come in during operating hours for a couple of slices of hot pizza and a cup of water at no charge. No questions asked." Although the sign reads "a couple of slices," Jenny told TODAY Food that "if someone comes in and they’re asking for our donation pizzas, we don’t give them a slice, we give them a whole pizza." By November 2016, the couple started working with one homeless shelter in the area by offering more free pizzas. Although Mike was battling leukemia at the time, he was focused on how they could continue to help others. The couple then extended their reach to three homeless shelters and put together a program to provide pizzas at no charge every week. "He said we have more than we need and these people are struggling to find their next meal, so why not help?" Jenny told TODAY Food. The pizzas are freshly baked, then frozen before they're shipped out so the shelters can use them when needed, Jenny explained. Volunteers from the shelters come to the store every week to pick up the pizzas. One of the shelters, New Life Center, has made the donated pizza part of a weekly program that people look forward to attending. "Once a week is pizza night and they’ve invited us to come and serve the homeless men," Jenny told TODAY Food. "I’ve been told that’s their favorite night. To have this little night, one time a week that's pizza night and movie night, may sound like a silly thing, but it's making a continual difference in these peoples’ lives." Mike passed away on Dec. 1, 2017 at 66 years old. Since her husband's death, Jenny hasn't slowed down with helping to feed the hungry and homeless. As of Oct. 1, the pizzeria had given away over 142,498 slices, which is about 17,812 whole pizzas and about $70,000 worth of food. "Our cost is 50 cents a slice, so we’ve presented it to the community so they can know where [the] donation will go," Jenny said. "It doesn’t cover everything, but it's been a generous outpouring and people will drop in their loose change at the counter," she continued. "We just created a GoFundMe fundraiser as well to help us continue to donate pizzas to our beautiful community." Jenny sees the continuation of the pizza program as testament to her late husband. "He really, really pursued this," she told TODAY Food. "It’s a small thing that we can do to bring a big difference in their day and it's just kept going. You have to come together to help each other out. We just do it because it seems like the right thing to do."